The Sailor's Pleasure, artist unknown, published by Sayer & Bennett, 1781, British Museum. Embracing this handsome young woman with a mischievous smile, the tar in this image wears quite a different outfit from those I've uploaded so far. Atop his head is a black round hat with narrow brim. His hair is loose and shoulder length. The white collar of his shirt appears from beneath the long and narrow black neckcloth tied into a large knot at his front. Though the far end of his jacket is obscured from our view, it appear by the length of the buttonholes that the jacket is double breasted with white metal buttons. His cuffs are fastened with five buttons with a flap, rather than a simple slash cuff. Interestingly, there is a button visible at the back of the jacket as well, suggesting a somewhat more formal affair than in previous entries. It might also suggest vents in the jacket. His waistcoat is a well fitted brown piece and likewise double breasted. It ends just below the waist and is cut across, just hiding the top buttons of his trousers. The trousers are particularly notable. All previous entries have featured sailors wearing slops, but trousers were just as common if not more so. Unlike slops, trousers could either be white or striped in red, as these are. The trousers have a broad fall fly and end above the ankle, giving us a good view of his white stockings. The pointed toe shoes have rectangular white metal buckles. 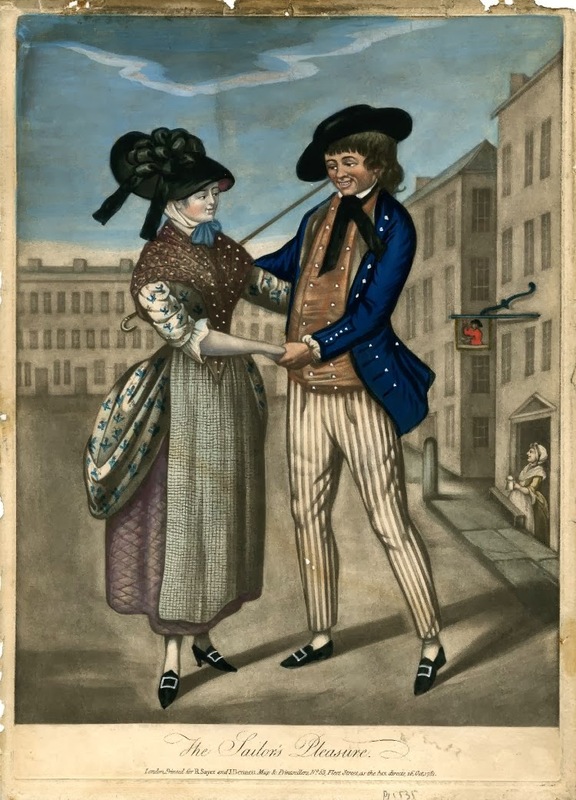 In his right hand he holds a crooked cane, tipped at just such an angle to resemble a shepherd's hook to guide away this young lady like a lamb!